Grapple : SARL Maxima, Specialists in the sale and reparation of machines and accessories for the construction industry. Importer and distributor of both hydraulic and pneumatic equipment. 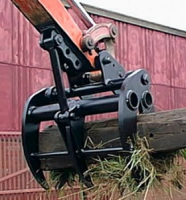 Our Mechanical Grapple is mounted to the dipper end & bucket link with standard hangers. This means it can be used in conjunction with a quick hitch.